We’ve all seen holograms in movies, and occasionally we see various versions of the effect in real life. The idea of having a fully three-dimensional image projected magically into space is appealing, but we haven’t quite mastered it yet. [Steven] hasn’t let that stop him, though. He’s built himself a very simple device to display a sort of hologram. His display relies on reflections. The core of the unit is a normal flat screen LCD monitor laid on its back. The other component looks like a four-sided pyramid with the top cut off. The pyramid is made from clear plastic transparency sheets, held together with scotch tape. It’s placed on top of the LCD with the narrow end facing down. 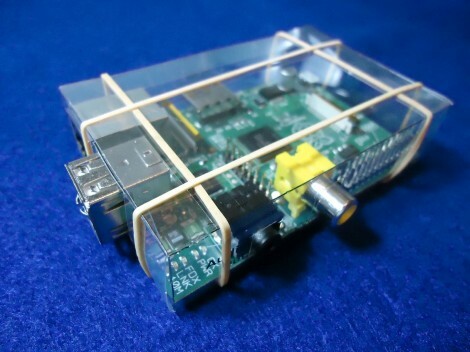 This flimsy case isn’t going to protect your Raspberry Pi if you knock it off the workbench. It will provide a level of protection against shorting out from contact with metal objects, or from liquids spilled in the near vicinity. [CGPatterson] ended up making this case from a single sheet of transparency film. The project is basically papercraft. He started with the dimensions published on the Raspberry Pi FAQ, which turned out to be wrong. Not having a caliper available to help with the precision of the measurements, he grabbed his ruler and did the best he could. The first two cases were a poor fit, but as you can see the third is like a glove. Luckily you don’t have to go through this same trial and error as he release the design. Both A4 and US Letter sized PDFs are available for download. Print them out on the transparency, cut along the lines, apply transparent double-sided tape to the tabs and you’re in business. If you wish to alter the design he has also posted the SVG source he made in Inkscape. This is certainly a good option for those of us without the ability to produce laser cut parts. [Grenadier] tipped us off about his method for building your own high-voltage capacitors. He thought the paper and foil capacitor project was a nice introduction to the concepts, but at the same time he knew he could produce a much more powerful device. For the dielectric he is using acetate film. This is the material from which overhead transparency sheets are made. He stuck with aluminum foil for the two plates. 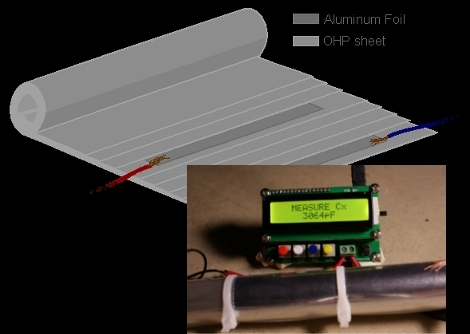 Just roll the foil flat with a rolling-pin, use thin wire to minimize the air that will be trapped between the dielectric layers, and make sure the foil plates are at least 4cm shorter than the acetate film on each end to prevent leakage. After rolling and securing the capacitor with zip ties you’ll be ready for the 3nF worth of fun seen in the video after the break. [Grenadier] mentions that this can be improved further if you were to vacuum impregnate the device with beeswax. There’s a pretty good chance that you already have everything needed to make this image projector. We thought that yesterday’s video projector was simple, but this one makes it look like a super-computer in comparison. [Esrun] grabbed a flood light, some transparency film, and a common magnifying glass for use in his still-image project. This is more-or-less an overhead projector without the mirror, but we though it was worth sharing in hopes that it would spark your imagination and produce some other projector-oriented hacks. The real tricks in this build are alignment and focal length. A single piece of lumber was used to help keep everything in a straight line, leaving just the vertical alignment to account for. In order to get the image in focus, [Esrun] had to do some testing for positioning the transparency film and the lens. In the end he added strips of velcro to the base to make the components easy to move. He plans to add an enclosure and change from an incandescent bulb over to a set of LEDs. We’d like to see the addition of a carousel that can house multiple transparency sheets. That or a side-scrolling roll to give it more of a film-strip feel. This is an interesting take on a music box. [Blair Neal] is using an overhead projector with a roll of transparency to make a synthesized music box. A camera watches the projected image and feeds data to Max/MSP to produce the sounds. Customization merely requires creative image analysis. In this case, different colored pens or different tracks can be assigned to a sound with the speed of the track based on how fast you wind the transparency spool.